Adaptor-related protein complex 1 associated regulatory protein, also known as AP1AR, is necessary for AP-1 dependent transport between the trans-Golgi network and endosomes. 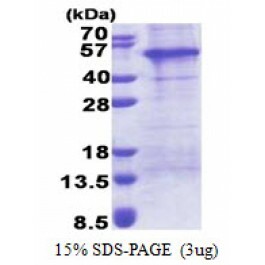 This protein regulates the membrane association of AP1G1/Gamma1-adaptin, one of the subunits of the AP-1 adapter complex. The direct interaction with AP1G1/Gamma1-adaptin attenuates the release of the AP-1 complex from membranes. Recombinant human AP1AR protein, fused to His-tag at N-terminus, was expressed in E.coli and purified by using conventional chromatography techniques.